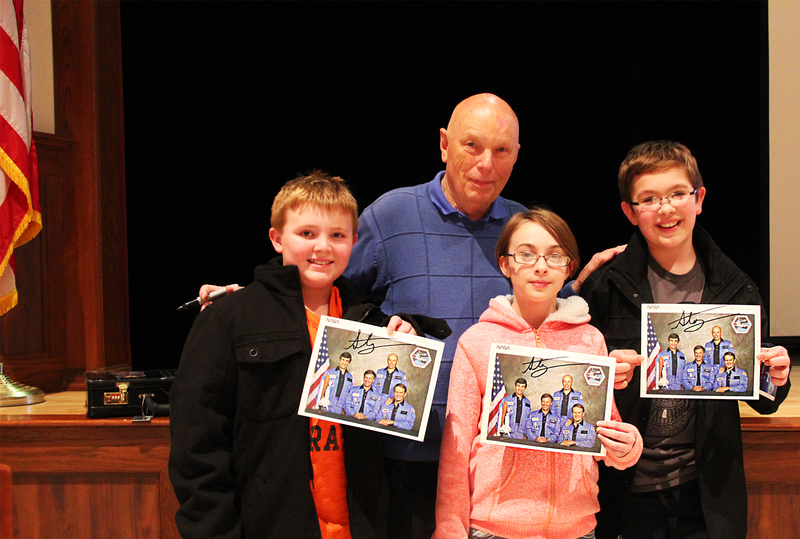 Mexico students excitedly waited in line to get the autograph of former NASA astronaut Story Musgrave at a recent STEM presentation held at the Mexico Middle School. 80-year-old Musgrave is the perfect example of science, technology, engineering and mathematics (STEM) applied in life. Mexico fifth grade students Ethan Franciso, Riley Wallace and Ryan Liedka pose with their autographed pictures and former NASA astronaut Story Musgrave. Marine, engine mechanic, aircraft electrician, parachutist, pilot, landscape architect, surgeon . . . Musgrave holds seven graduate degrees in math, computers, chemistry, medicine, physiology, literature and psychology, and has been awarded 20 honorary doctorates. Some in the audience may have felt overwhelmed with awe at the greatness of Musgrave’s accomplishments, but the former astronaut assured each student that they were capable of achieving anything they were willing to work at. The ex-Marine emphasized the importance of learning, and he encouraged the audience to soak up every ounce of life that they could. He shared that the secret to his success was in curiosity and exploration, discipline and making the connections between learning experiences. 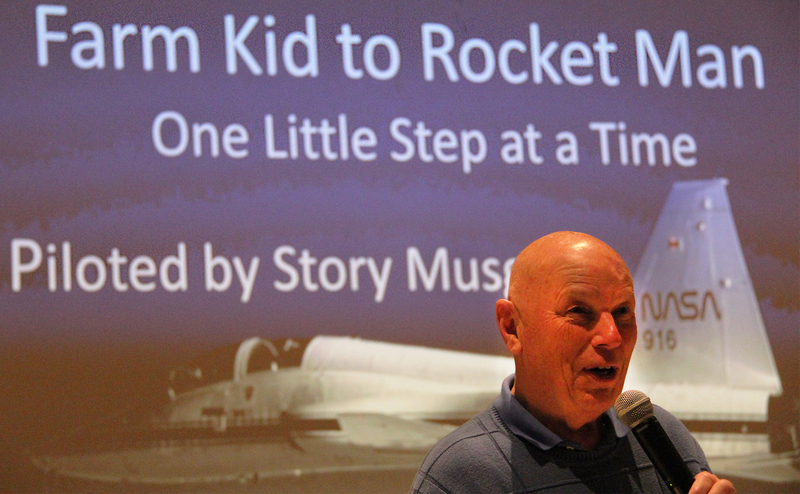 Former NASA astronaut Story Musgrave shares with the students of Mexico Academy and Central School the importance of STEM education. His time in the Marines taught him discipline, his background in medicine helped him to work as a trauma surgeon during his 30-year astronaut career, and his childhood on a farm helped him to understand mechanics and engines. An underlying message throughout Musgrave’s life story is hard work and dedication: to get the job done and to get it done to the best of one’s ability. The eyes of dreamers beamed by the end of the night, and the Mexico students seemed to possess a newfound understanding of how crucial their education is. 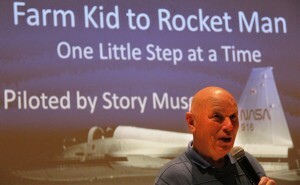 For more information on Musgrave and his life, visit www.storymusgrave.com.